Since the dawn of science fiction, robotics have been associated with the automation of manual tasks. The etymology of the word itself stems not from some brilliant scientific mind, but a Czech playwright, Karel Čapek, who introduced it in his 1920 play, ‘R.U.R.,’ or ‘Rossum’s Universal Robots’. The word ‘robot’ in the title is adapted from the old Church Slavonic word, ‘robota’ which translates to “servitude,” or “forced labour.” Robots have always been thought of as a way to make our daily lives more efficient but have also seemed like a distant-future type of luxury. Not until relatively recently has robotic automation felt like an attainable goal, and with the advancements in technology that we’ve seen in as recent as the last few years, robotics in the security space might be closer than we could have once anticipated. Let’s be clear, the idea of robots in the workforce is not entirely a far-flung idea. Robotics have been used in industries like manufacturing for years. Robotic arms and the like are used to assemble cars and create components to manufacture objects that we use every day. We’ve even recently invited robots into our homes in the form of robotic vacuums and other smart-home devices. However, adapting this technology to the security industry is something else entirely. Compared to robotic security, or Unmanned Aerial Vehicles (UAVs), a robotic arm on an assembly line is a relatively simple piece of machinery. In order for robotics to truly penetrate the security sphere, sophisticated artificial intelligence (AI) is necessary in order to detect anomalies, threats, etc. However, once the technology is where it needs to be to make robotic security a realistic service, its benefits will far outweigh the cost of implementation. 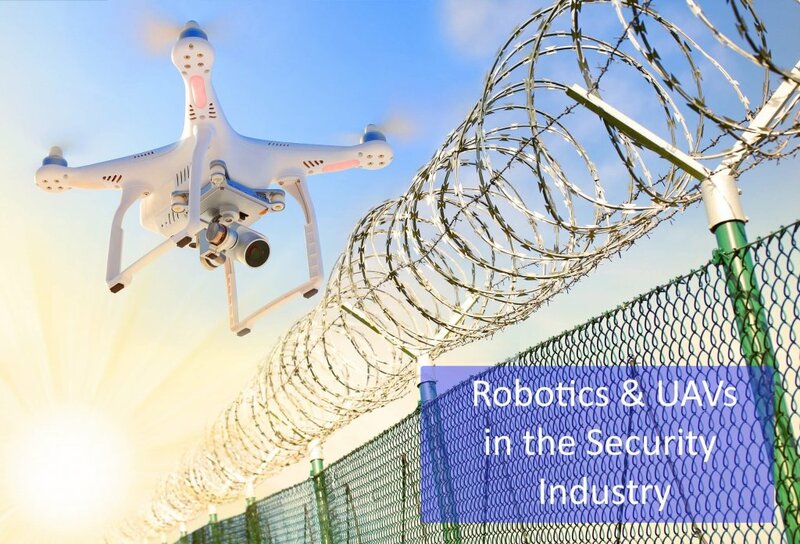 The (constantly) increasing cost of providing guard services for large areas coupled with the baked-in risks of employing a human person to monitor your property are non-issues when it comes to automating your security systems with robotics & UAVs. Technological advancements in UAVs means that your security system would be outfitted with high-definition, and infrared (IR) cameras, as well as bio-threat detection out of the gate. Plus, the UAV or robotic security system would use cloud storage for future referencing to allow it to alert the appropriate authorities should a repeat incident occur. Additionally, (and this sounds like a line from familiar movie) a UAV or robotic security system will not tire, it won’t require a break, and in the event of a potentially dangerous situation, the loss of a piece of machinery is dwarfed by the possibility of harm coming to a human employee. Of course, the widespread implementation of robotics in the security domain will rely on dedicated providers with dedicated solutions. Unfortunately, at this juncture, there are very few of those. With the number of variables that go into patrolling a property or campus, etc. security subsystems such as: video management, intrusion, and physical security information management (PSIM) to name a few will need to go beyond predefined programming. This is where AI and machine learning come into play. A trigger (such as an alarm) will need to occur for a dispatch of security systems to take place. Once the dispatch occurs, situational analysis will happen. Artificial intelligence will allow the robotic system to know when security systems should be dispatched, and machine learning will allow the systems to better and more efficiently react when a threat or anomaly is detected, without human intervention necessary. The thought of using robotic security systems to protect your investments may at first evoke thoughts of an episode of Black Mirror, but once the technology becomes more commonplace, it’s not outside the realm of possibility to imagine more business owners or property managers going this route to monitor their sites. The increased benefits and diminished risks when it comes to providing safety to a human employee, coupled with the potential for dedicated providers to offer Robots as a Service (RaaS) as a way to keep users on the cutting edge of the technology means that it would be almost a no-brainer to choose to have your assets protected by a robotic security system.